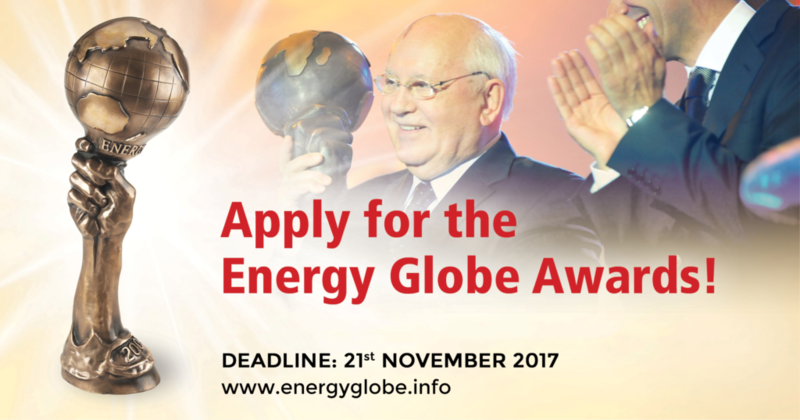 ENERGY GLOBE Award 2017 Applications Now Being Accepted - GreenBuzz Berlin e.V. The Award competition is open to any individual, private or public institution, company, NGO or any other types of groups or organisations. “Participation is open to projects which focus on resource conservation, improving air and water quality, energy efficiency and renewable energies” adds the website. There is no cost involved with submitting an entry and individuals or organisations are free to submit more than one entry if they wish to. However, projects that are submitted must have already been implemented or are nearing completion. If a project is not assessable in its current stage it will not be considered. Continuous projects, that are ongoing but have not yet been completed, can also be submitted if they have already demonstrated innovative and shown impressive results to date. Participants who enter go into the contest to win a National ENERGY GLOBE AWARD as the best project submission from a particular country or an Energy Globe Award as a global winner of six different categories including Earth, Fire, Water, Air, Youth and ‘Sustainable Plastics”. All six global winners will receive a cash prize of 10,000 Euros. The winners will also be honoured as part of a ceremony held in Tehran in January 2018 that will be broadcast worldwide as well as featured by international media. In 2016, projects were submitted from over 170 countries across the Earth. Individuals and organisations with an interest in improving health by mitigating or reducing the effects of climate change are also encouraged to participate in the Award contest. One project they might draw inspiration from is Mohamed Ramadan’s project on recycling and purifying wastewater which was the 2016 National Energy Globe Award Egypt prize winner. The purifying innovation is important because it means people now have a more affordable, option for purifying the wastewater they collect for cooking and human consumption purposes. It also means they are less likely to get sick from consuming wastewater that has not been purified and will be healthier as a result of not being thirsty and consuming chemicals that are good for the body. In order to enter the ENERGY GLOBE AWARD 2017 competition, participants must complete the application Word document provided on the organiser’s website and meet all the criteria set out in the application checklist. The application, written in either English or German, then needs to be submitted through online submission platform which is also on its website.